1. In large saucepot, heat oil over medium-high heat. Add ground turkey and cook 5 to 7 minutes or until browned, breaking up turkey with side of spoon. 2. Stir in chili powder, cayenne, cumin and salt. Stir in crushed tomatoes, garlic, leftover turkey, cilantro and jalapeño. Stir in beans, celery, onions, bell peppers and broth; heat to boiling over high heat. Boil 5 minutes. Reduce heat to medium; cook chili 7 minutes, stirring occasionally. 3. Transfer chili to 5- to 6-quart slow cooker; cover and cook on high 5 to 6 hours. To serve, top chili with cheese and sour cream, if desired. Enjoy this recipe year-round using rotisserie chicken or turkey. 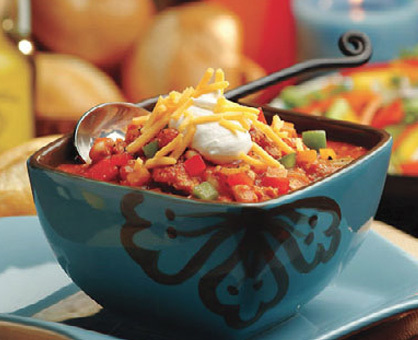 To avoid a mess, use a large ladle to transfer chili to your slow cooker. For best results, pull and break apart your leftover turkey before adding it to the chili mixture. Healthy substitute: To save calories, divide servings into smaller portions and substitute regular sour cream with fat-free sour cream.